1952 Wedding of Jack Pain and Mary Pain (nee Bermingham). Click on the photograph to open a large version in a new window. 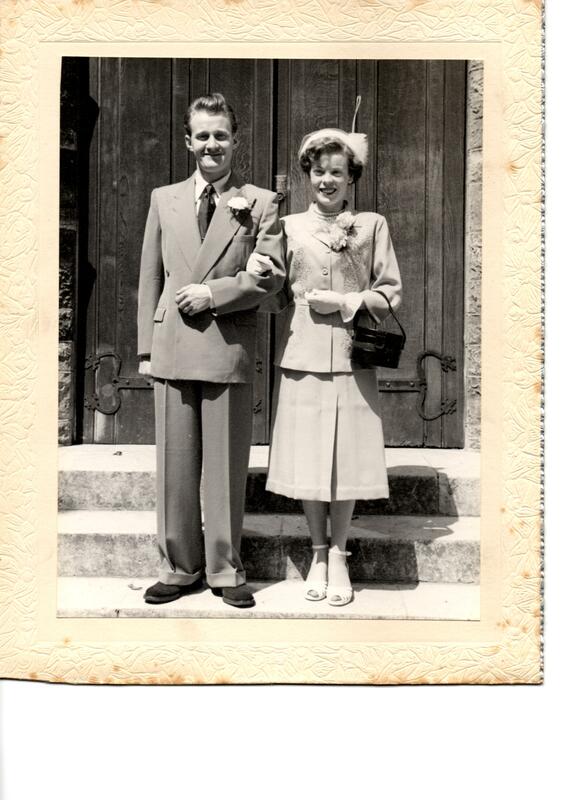 This was my mum and dad’s wedding day at St Mary’s Roman Catholic Church, Surrenden Road, Brighton on 5th July 1952. It was a very small gathering, with only a few guests including my paternal grandmother, best man and a friend of my mum. My mum lived in Celbridge, Co Kildare in Southern Ireland then moved with her aunt to Tivoli Crescent, Brighton. My dad lived in Dean Street, Brighton. My mum remembers it was a very hot day and after the service they went for a meal in the centre of Brighton and then in the afternoon went to the pictures to get out of the heat. Both are now living in Lancing, West Sussex and will be celebrating their 60th wedding anniversary this year. Hi Angela, Sorry the wrong Mr and Mrs Pain. Lovely to see your comment though. Do you still live in Brighton?